Storytelling is an incredibly powerful way to teach organizations about their customers. While most organizations are adept at gathering data on their users, the data often fails to communicate the complete experience throughout a user’s journey. While there are methods of capturing user emotions during inner-task nuances (see KLI’s Mood Meter), we often measure satisfaction in a cumulative manner. Your users may have reported a 7 out of 10 on the satisfaction meter, but did they ever fall below a 3? That’s where journey mapping comes in. A journey map is a visual map that tells the emotional and behavioral story of the user’s journey through different touch points. Touch points can be defined as any point of contact where the user interfaces with other people or systems. The exercise of simply identifying all of the different user touch points is often a very eye opening experience because it gives an organization a chance to walk in the user’s shoes as a group. That’s empathy! Key Lime interactive has conducted workshops with other organizations to assemble this user empathy and align strategic business objectives. The focus of these journey maps can be micro-level within a specific step, or they can be macro-level where a holistic view of the total experience is communicated. While there are always opportunities for improvement, the goal would be to identify the lowest points, or Moments of Truth, that when rectified can really move the user experience needle from “good” to “great”. While most examples of journey mapping deal with customers, their purchases, and their engagement with a brand, Healthcare journey maps are focused on ensuring the services provided to patients or providers meet mental and physical health related standards. Organizations like the Human Factors and Ergonomics Society (HFES), AAMI, and the FDA are constantly pushing to ensure that services or software used to treat and serve patients maintains extremely high usability and safety related standards. 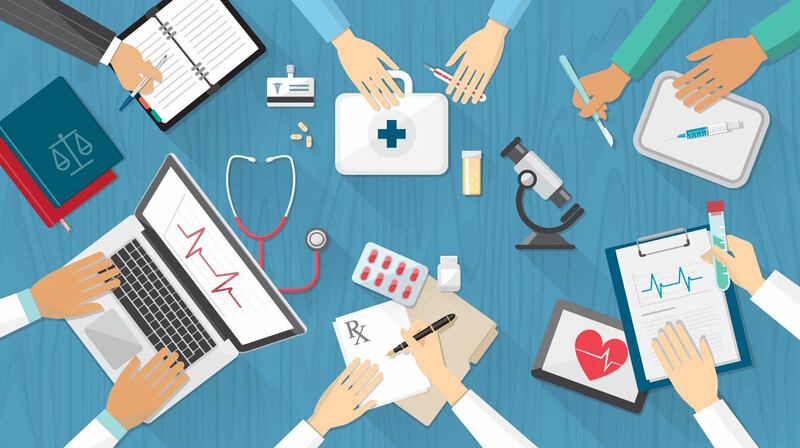 Documents such as IEN 62366 and HFE 75 communicate the usability and risk related requirements for medical devices and software and should be adhered to first and foremost. While the FDA standards are extensive and extremely complex, a journey mapping exercise is a great way to take a holistic view of your organization’s interactions with a patient, or practitioner. Since I have lead workshops related to healthcare journey mapping in the past, and recently tore my ACL and meniscus, I decided to make my own journey map as a patient through the various touch points I encountered prior to and post ACL replacement surgery. There were many highs and lows throughout this journey, but one theme of the journey became clear; I needed constant reassurance. Whether it was from my insurance provider telling me I’m covered, the anesthesiologist telling me how my anesthesia would be administered, or the surgeon telling me the surgery looked great, I wanted to know if everything was normal, unusual, or (hopefully) better than expected. Throughout the journey I identified opportunities for improvement and a variety of solutions that could have proactively met my needs. Perhaps I am a bit needy, but the story I constantly tell clients when I laud the use of journey mapping is about an 8-year-old girl about to get an MRI. Engrossed in utter fear of pain, her concerns made her less approachable and more resistant to doctors. After conducting a journey mapping exercise, the MRI manufacturer identified the theme of the journey. “Feeling safe.” Using that theme and a cross organization effort to make a little girl feel safe, this manufacturer found the solution was to simulate, “A camping trip.” Using art throughout the room and even on the MRI itself, the room was transformed into a forest the girl was given a backpack with goodies. The colored and beautified MRI device became her personal little tree house where she felt safe amongst the cute and fuzzy characters that were drawn throughout the room. Do: Make this a team exercise and emphasize cooperation. Utilize the strengths and diversity of your team members. Don't: Make this a leadership-only exercise. This is a collaborative effort. Make sure to conduct this with as many people as possible. If your organization has a large number of employees, breaking this exercise up into teams to tackle particular sections, personas, or journeys tends to work really nicely to get everyone involved. As an alternative, you could have multiple teams tackle the same journey independently, then meet to compare results. Let the strengths of your team come through and contribute to your solutions. Do: Find images that are relatable and inclusive of most, if not all, of the user segment variations. These images need to be relatable. Don't: Use images of all beautiful models. If your employees can’t relate to the images of your customers, there will be a significant amount of dissonance when distributing your journey maps throughout your organization. This doesn’t have to be a photo, but it should be something that communicates what persona you are referring to. Many organizations have difficulty absorbing behavioral personas or journey maps if these images don’t reflect their true customers. Aim for real people and ensure that the person matches the appropriate age group, style, or attire that you would find that persona in during their engagement with your brand. This fictitious representation is intended to create visual references to a large group of users that make up your behavioral persona. Don’t choose an image that excludes part of the user type. Do: Use the most frequent behaviors found in your research to serve as a stickman for your persona’s journey. Leave out activities or behaviors that may exclude some variation. Don't: Randomly pick a journey. Ensuring that you are focused on a journey map that truly reflects the engagement flow of your persona is critical to developing the right solutions. This is intended to tell the persona’s story, but it should represent an aggregate of users. One way to define this is to find the most commonly shared attributes, behaviors, and activities of the persona and use that to tell the story. You may get stuck in some of the details, as there is never only one journey for a customer. For consistency purposes, using the most frequent story can alleviate some of the guesswork and minimize the back and forth to make the perfect story. Do: Use sliders, pie charts, and other visual iconography to quickly communicate attributes at a glance. Don't: Make this part wordy. There is a lot of content in this journey map. You don’t want to make users work to learn the differentiators. Show a few polarizing attributes so you can get a quick understanding of persona attributes and primary behavioral drivers. These values should come from research efforts that ask users/patients to rank items in order of importance. Make sure the values are intuitive and quickly communicate the differences and similarities of each persona at a glance. Make sure that those visuals don’t vary much aside from the values. That way when you switch between your personas, the only things that move are the sliders. Do: Use brevity when creating these principles. This is where your marketing and content writing team can tailor a phrase to speak volumes about a user segment. Make it powerful. Don't: Use principles that are shared by more than two personas. The last thing you want is to highlight all of the similarities. Your goal should be in understanding the differences between the personas so you can optimize the experience for each one. Do: Refer to actions that have been researched in the past and can be validated through this exercise. You’ll want to understand what the user/patient is feeling during these actions and how you can move the needle towards a stellar experience. Don't: Show inconsistencies between your persona’s details and these actions. The synergy between the two sections is critical to fully empathizing with the journey. What action is the user taking at each touch point? This part should be relatively straightforward. You will want to align tasks used in other research so that you can enrich the journey with realistic scenarios. These actions should also accurately match the persona’s story. You don’t want to create confusion by introducing variations between the Persona Details and the actions in the journey map. Do: Make sure to spend some extra exploration around this topic. Surface value needs can work, but it’s the hidden need that you uncover through collective discovery that resonates the most. Don't: Make these needs too generalized. If you slack on this section, you may end up tackling problems that already have a solution. Try to emphasize user/patient empathy by walking in their shoes and discovering their true needs at each touch point. What are the needs that motivate the user to take action? Whether it’s a need to feel safe or a need to be seen, those needs are what ultimately drive user behaviors into action. Try to explore beyond the obvious needs and you may discover new themes that resonate with your team. For example, “Need: See my doctor” would not give you much; you have to dig a bit deeper. “Need: Hear updates regarding my progress,” would give more details as to what emotion the user/patient is hoping for. Do: Use quotes from research to bring thoughts and perceptions into reality. Emotions drive behaviors, so this is the front line of making a difference to your target audience. Don't: Assume you know what your users/patients are thinking. If you’re uncertain, ethnographic research may be needed to identify the thoughts and perceptions of your users while they are engaging with your brand. What is the user thinking and feeling prior to, during, and following each action? This section is often times a reaction to the needs, actions, and guiding principles. In the example of the little girl, research noted that prior to getting her MRI she was thinking, “Is this is going to hurt?” Her biggest need was to feel safe so her perception was fear and uncertainty. Using that information, you can now begin strategizing on how to change that perception. Do: HAVE FUN. This is a great time to be creative and use your imagination. There are no wrong answers (within reason J). Don't: Discourage ideas. There will be time for curating possibilities later. Focus on participation. This is the good stuff! Brainstorm! Collaborate! Pull everything on the table to think of strategies to improve those moments of truth, and hopefully every touch point. I strongly recommend a team exercise where all ideas are put on the table and ideas be curated as a team. Following this exercise, decision makers will be able to align their strategic business objectives with these findings and prioritize new solutions. Do: Introduce ownership as something honorable and exciting. Create follow up meetings in a casual setting to review progress in a positive manner. Don't: Make this a punishable task. If someone needs assistance with their portion, be proactive and shift resources as needed without alienating or belittling anyone. Be cautious not to assign any blame, as that may hinder collaborative efforts and make some departments defensive. Assigning ownership is a great way to give the target department or people the support they need to make a positive difference in the user’s experience. While the ownership may be relegated to one department or person, the entire organization should be involved in its progress. Show support for each other to boost the morale of those taking on the tasks of improving your business. Do: Be proactive and prioritize the low points in the journey. Consider the duration of time needed for the user/patient to recover from those low points. Don’t: Minimize the impact of these moments-of-truth, as often times it takes only one bad experience to share a post about displeasure all over the Internet. Some business is forced to permanently see those comments even after solutions have been implemented. These opportunities should align with strategic business objectives and will allow organizations to focus efforts on the areas that can create the most return for investment in design, development, and validation. This section typically falls in the hands of the leadership team after weighing in all of the feedback. Cost benefit analysis may be required to choose the right opportunities to pursue, but I usually encourage focusing on the lowest points in the journey, or moments-of-truth, to get maximum impact. These tips should help you lead a collaborative exercise under the mission of user empathy. If you would like more information or guidance on how to optimize your journey mapping skills, check Key Lime Interactive’s Journey Map playbook. Interested in finding out more about journey mapping? Or even if you just want to say hi and see how my knee is doing (it's getting better), reach out to us at info@keylimeinteractive.com.